London Music Masters (LMM) announces the three winners of its first LMM Awards - violinists Jennifer Pike from the UK, Agata Szymczewska from Poland and Elena Urioste from the US - and will present them in one-hour recitals at the Wigmore Hall in October. The LMM Awards are a career development programmes, which assist talented, young professionals to develop further their musical careers. Established a year ago by Victoria and Richard Sharp, London Music Masters is an inspirational organisation, committed to nurturing enthusiasm and musical potential at all levels of the developmental process. To launch the three-year scheme, the LMM Award Winners will perform individual afternoon recitals at London's premiere chamber music venue. Elena Urioste will make her UK debut on Tuesday 20 October. Jennifer Pike returns on Thursday 22 October and Agata Szymczewska will also make her UK debut on Saturday 24 October. Following the recitals, one of the award holders will have the opportunity to perform a concerto with the London Philharmonic Orchestra under the baton of Osmo Vänskä at the Royal Festival Hall in the autumn of 2010. Created by renowned Russian-Israeli violin pedagogue Itzhak Rashkovsky, the LMM Awards support three exceptional violinists, between the ages of 18 and 28, over a three-year period. Assisting the long-term career development of the award holders is the driving principle of the LMM Awards, for which Rashkovsky has formulated a comprehensive programme. Each award is tailor-made to suit the individual violinist, providing a financial reward of £10,000 each, mentoring from a team of music industry specialists, concerts in London and internationally, recordings and the possibility of instrument loans, where needed. A key element of the LMM Award winners' role will be to inspire and mentor school children, conveying their enthusiasm to those in their own community and those involved with LMM's educational initiative, the Bridge Project. "The LMM Awards are not simply trophies at the final of a competition. They represent the beginning of an exciting musical journey. Our 360-degree approach will provide sustained support for these young musicians at a crucial stage of their professional careers." The LMM Awards involve a unique selection process. An international network of highly respected individuals, recognised for their music-related accomplishments, talents and directorships of prestigious music institutions worldwide, proposed an initial selection of candidates from which the Nominations Team choose three award winners. The Nominations Team includes conductor Sir Roger Norrington, Wigmore Hall's Director John Gilhooly, Grange Park Opera's Founder Wasfi Kani, the Sphinx Organization Founder and violinist Aaron Dworkin, music producer Andrew Keener, the Royal College of Music's Director Colin Lawson, the Southbank Centre's Head of Music Marshall Marcus, the LPO's Chief Executive and Artistic Director Timothy Walker, the LPO's Chairman of the Board of Directors Martin Höhmann, Director of Beares Simon Morris, RCM's Head of Strings Mark Messenger and the financial advisor and classical musical enthusiast Nicholas Berwin. London Music Masters, a registered charity, has created two main strands for their activities - the LMM Awards and the LMM Bridge Project. The charity's aim is to complete the cycle from early inspiration to life-long aspiration - inspiring primary school children and assisting emerging professional musicians. One of LMM's primary goals is to address the under-representation of ethnic and socio-economic diversity amongst musicians in professional music ensembles. "Classical music needs powerful advocates who can communicate a passion, whether on the stage or beyond. It is not only about captivating a concert audience but also about inspiring those in the wider community - particularly the next generation of emerging musicians and potential new concertgoers. For this reason, the winners of the LMM Awards were also chosen based on their potential and enthusiasm for working as role models at a grass roots level within schools." LMM has created partnerships with the Wigmore Hall, LPO, RCM and relationships with the Southbank Centre and the Sphinx Organization in the US. LMM is funded by private donations and the long-term aim is to establish an endowment to secure its longevity. The LMM Bridge Project aims to give young children, regardless of their ethnic and socio-economic background, an opportunity to discover classical music. By inspiring an early enthusiasm and developing strong skills, LMM seeks to enable children, as young as five years of age, to bridge the gap to a life-long appreciation of classical music. Above all, the objective is to open up opportunities for any talented and disciplined musician, nurturing their potential to aspire to the top. The wide reaching programme offers weekly music classes, provides instruments and gives workshops with LPO Players, RCM students and LMM Award Winners. Working with the children and their families, they have created a multi-generational choir and a variety of initiatives to encourage family involvement, including subsidised concert tickets. LMM has just completed its first year at two formerly underachieving primary schools in Lambeth Jessop and Ashmole Primary Schools. The initial results have been far-reaching, giving children improved discipline and concentration, confidence and self-control, cooperation and enhanced social skills. Since becoming the youngest winner of the BBC Young Musician of the Year in 2002 at the age of 12, Jennifer Pike has emerged in recent seasons as one of the most gifted of the younger generation of British artists. 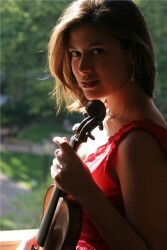 Despite early recognition and critical acclaim for high-profile appearances such as her BBC Proms debut at the age of 15, Jennifer has maintained a carefully balanced programme of education and development, which has seen her mature steadily, growing into a wonderfully communicative musician and technically assured violinist. Jennifer has recently signed a three-year contract with Chandos, with whom she will record the Rozsa Violin Concerto in summer 2009. Jennifer plays a Matteo Goffriller violin of 1708. Born in Gdansk, Poland in 1985, Agata Szymczewska has been establishing herself as a promising young violinist. She became the winner of the 2006 Henryk Wieniawski International Violin Competition and a laureate of the International Yampolsky Violin Competition in Moscow in 2006. She has performed with orchestras such as the Lahti Symphony Orchestra, Sinfonia Varsovia, Vilnius State Symphony Orchestra and collaborated with conductors and musicians such as Krzysztof Penderecki and Krystian Zimerman. Earlier in 2009, she performed and recorded Grazyna Bacewicz's Piano Quintets on Deutsche Grammophon, to commemorate the centenary of the composer's birth. Agata plays a Stradivarius violin, c.1680. Elena Urioste, recently selected by Symphony magazine as an emerging artist to watch, has been hailed by critics and audiences alike for her rich tone, nuanced lyricism and commanding stage presence. Since making her debut with the Philadelphia Orchestra as a winner of the Greenfield Competition at the age of 13, she has appeared as a soloist with major orchestras throughout the United States including the Cleveland Orchestra, Boston Pops and National Symphony Orchestra. She is a first-place laureate in both the Junior and Senior divisions of the Sphinx Competition, which resulted in her Carnegie Hall debut in 2004.